Need to take kitty along for your ride? 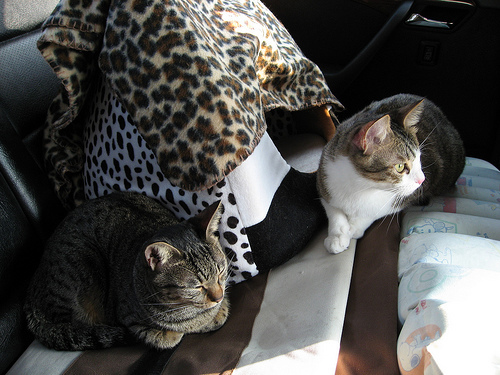 Most cats hate the car, and will usually spend a while complaining until they fall asleep. However, there are ways to make your journey more enjoyable and safe for the both of you. Make sure you have an ID tag with your phone number for your cat when you go on the road. Cats will sometimes run away from their owners when they are out of their comfort zone, and may not have the orientation to turn back. Take along a copy of your cat’s latest veterinary records, in case of emergency, and definitely if you are traveling to another country. In case something happens and you need to put your cat in a kennel, you will be required to present these documents. Many cats have the problem of throwing up in the car. 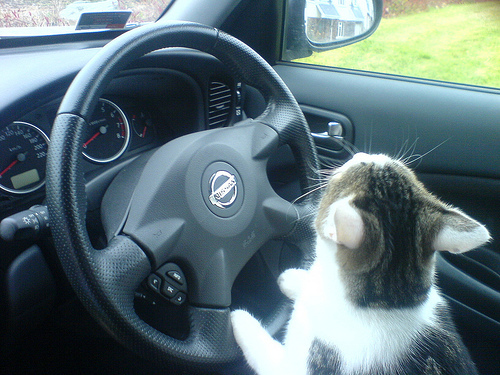 If you are going on a long road trip, it is a good idea to get your cat used to the car. You can do this by taking your cat into the car with the engine off, and then taking it on short trips, such as into town. Before you drive on your trip, try not to feed your cat within three hours before taking off (though make sure it has eaten thoroughly before). You can also purchase anti-nausea pills that often do the trick, though it can be hard for your cat to swallow them. Some cats may start drooling and acting very quiet due to nausea in the car. Bring a roll of paper towels or rags and be prepared! It is usually a good idea to bring your cat in a carrier for road trips. If your cat is often full of energy, it may walk around the car and try to get under the pedals or over your head, which is dangerous. When you buy a carrier, have your cat get used to it first. Put it indoors, open with some treats inside it, so that it can get used to its feel and smell. Do not try to force it inside, as it will always have those connotations to the carrier and try to avoid it. Cats like being in small spaces, and they will like that it smells like home. Bring food and water from home, and give it to your cat in its own bowls. Don’t experiment with new foods while traveling. Cats will pant when they become hot. If you want to be extra safe, you can invest in a harness and leash. I am traveling down to fla. in january and my cat (Rusty) will be with me & my husband. Are there laws in states that require cats to be in cages and what states are they. She really really hates her cage.